Online shopping has become the norm for Americans. Gone are the days of browsing the mall or catalogs for gifts or household items. Now in just a few clicks you can find what you’re looking for online and have it at your doorstep in a couple of days or even sooner. Convenience is great, but it can come with a cost. And that cost is there are just too many choices out there! Too many places to shop and too little time to check them all. Who knows if you’re getting the best price or if it will drop the very next day. Fortunately, there’s an app for that. It’s called Paribus. And it’s pretty simple. Once you have the app up and running, it works by scouring your registered email address for any online purchase receipts. It will then monitor the web to see if there have been any price reductions for the things you’ve bought. If it finds a lower price, then voila! You get the difference charged back to your card as a refund. Once you get it set up, it is super easy because you don’t have to do any work! No need to look for price drops on your own or to stay on the phone with customer service trying to get your money back. The app will scan your receipts and get your money back for you. Download the app on your smartphone and register with the email address you use for online purchases. Add a credit card so it knows where to send your money. And that’s it! Paribus looks for price drops on your behalf. Another cool thing Paribus will do is to look for any online coupons you may have forgotten to apply. During the hundreds of online purchases most people make in a year, we will probably forget to look for a coupon for some of them. 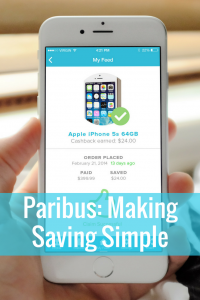 Paribus will look for any on your behalf and get them applied to your purchases and save you even more money. With apps like these, security is always a concern since you need to provide access to your email address. This concern has been addressed as the app developers have assured that only receipts for online purchases are tracked and that there is no direct way for them to read your emails. So if you’re kicking yourself about buying something right before the price drops or if you just don’t have the time to contact a company directly to get your money back, Paribus will do the work for you. All you have to do is download the app, register and the Paribus will take care of the rest!